In the last couple of years l have had many customers who have come to me with a broken aluminium door lock. Some have be told in error that these locks cannot be bought anymore and it is best to replace the entire door, needless to say this is not true. In fact the exact locks can be supplied and it is a very straight forward job to replace them. 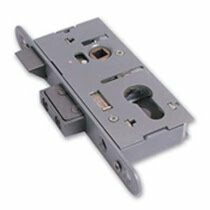 These locks are in two parts, the cylinder or barrel is separate from the lock body or lockcase, as it is termed in the lock industry. The spacing between the centre of the spindle (square bar) and the centre of the keyhole is 48 mm usually and handles with this euro profile size and spacing are availale. Newer doors may have a lock with a 92 mm centre to centre spacing and of course we sell these replacement locks as well. Normally there is no need to replace the handles when replacing the lock so long as a correct fitting lock is used. For those with some fixing skills and a few tools including a drill, there is an inexpensive alternative even. We have developed and tested this solution for situations where the budget for repairs is smaller. We can supply a lock that fits with minimal alteration to the door and this works perfectly with the old handles. So in a situation where you have a broken lock in an aluminium door, once you find us and contact me your problem will be sorted. Call out service is available for those customers who need a little help with the removel and refixing of the new lock. have a look at my web site handlesupplies.com call me on 021 488 3131 or 087 2577 649 or drop into our warehouse store ar Cobh Cross, Carrigtwohill, behind Greenwood/Lakewood furniture store; just off the Cork-Midelton deul carriage-way, only 5 miles from Cork. replaired...if you read this blog tell your friends about it as they may need what we sell..I include here a picture of this lock which can be so hard to find!! Interesting site, i read it but i still have several questions. shoot me an email and we will talk much more becasue i might have an fascinating idea for you. I am enjoying this blog. Its an informative topic. It help me very much to solve some problems. Its opportunity are so fantastic and working style so speedy. I think it may be help all of you. Thanks a lot for enjoying this beauty blog with me. I am appreciating it very much! Looking forward to another great blog. Aluminium lock is safe and easy to use, many doors company use this lock. this is nice information.